At Rouse Hill Smiles we provide a unique, end-to-end solution for dental implant treatment, helping patients see the process through from beginning to end. Unlike some dental practices who need to refer their patients to specialists for the surgical component, Dr Teena is able to perform the entire dental implant surgery right here in our Rouse Hill facility, saving you both time and additional costs. We provide patients with a number of solutions to replace missing teeth and achieve a beautiful smile. These include treatments such as mini dental implants, multiple dental tooth implants, and implant supported dentures. 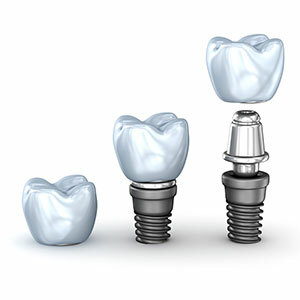 Dental implants serve as an artificial tooth root made from titanium that is surgically-fitted into the jaw bone. Once the site has healed, promoting the implant to fuse with its surrounding bone, our dentist then fixes a crown, replicating a natural-looking tooth. When you attend your consultation with Dr Teena, she will assess your mouth to determine if you are a candidate for dental implants. This also involves taking intra and extra oral photographs, along with a CT scan of your mouth to provide a more comprehensive overview. After just 2-3 days, you are then able to visit Dr Teena once again to view a 3D model of your mouth, created from the scans and impressions. Our dentist explains the treatment to you thoroughly, discussing the dental implant process, associated costs, and potential risks. We pride ourselves on being upfront and honest with patients at all times, as their individual needs are of utmost importance to us. As the name suggests, multiple dental implants simply refer to more than one implant. This procedure occurs when the patient has multiple missing teeth in their mouth, which are suitable sites for dental implants. In case of collective missing gaps, dental tooth implants with a bridge can be fitted. This consists of the crowns on dental tooth implants, as well as pontic crowns. While a regular denture rests on the gums, this can sometimes cause concerns for the wearer, leaving the denture feeling loose or unreliable. In some cases, we are able to make the denture more secure and durable by supporting the structure with implants. Additionally, an implant-supported denture is typically used when the patient lacks teeth in the jaw, but has enough bone in the jaw to support implants. If you’re considering dental implants but don’t know where to begin, Rouse Hill Smiles offers free consultations for patients to learn more about the treatment and discover if they’re a candidate. Don’t let unreliable dentures or missing teeth affect your smile any longer. Contact (02) 8320 0548 today!